Normally to copy a file or folder into another location, you right-click the file then select Copy and right-click it the destination folder then select Paste. What if you can just Right-Click the file and Windows shows a pop-up dialog where you can choose your destination. 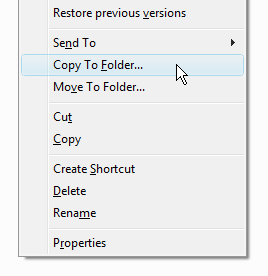 This is possible with a registry hack that will let you add a Copy To Folder or Move To Folder to the right-click menu. After you apply the hack, you should see now the new menu shortcuts on your Right-click menu. Click it to display a pop-up dialog box where you can select the desired folder.